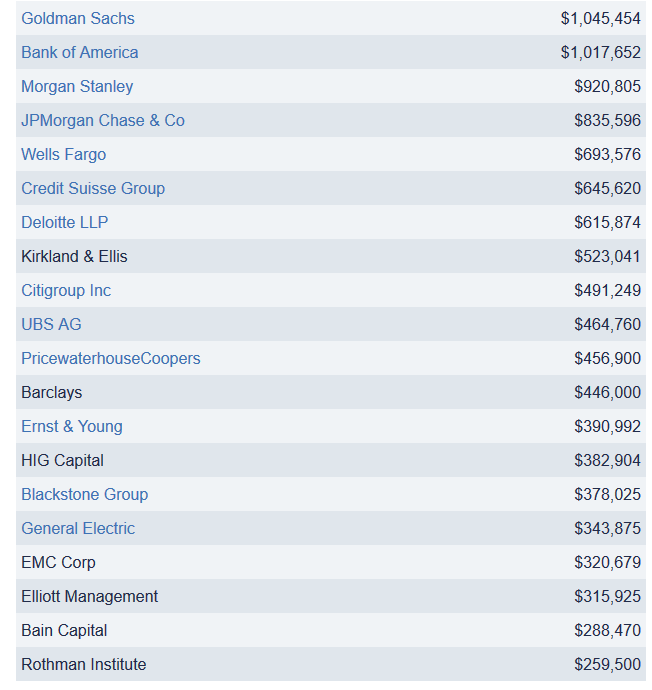 Below is a list of donors to Barack Obama’s 2012 presidential campaign. The list is from Open Secrets which tracks all donations made to candidates. 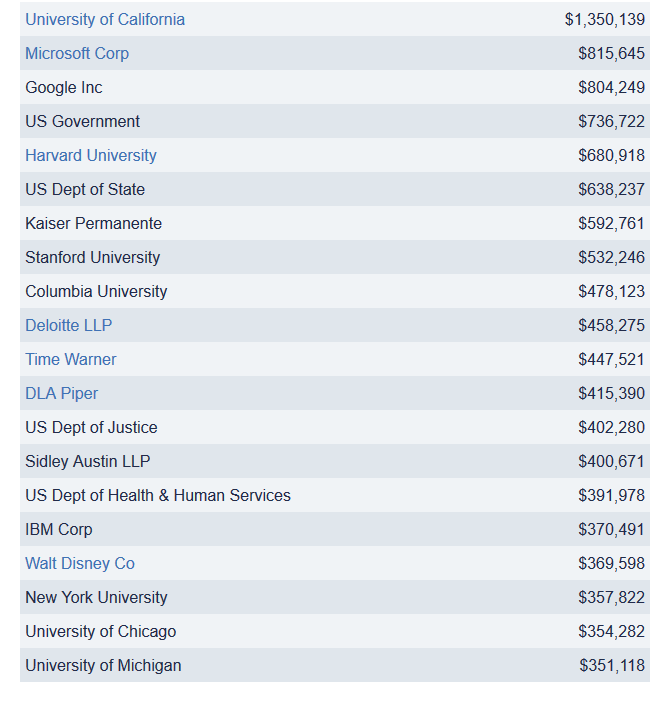 This table lists the top donors to this candidate in the 2012 election cycle. The organizations themselves did not donate , rather the money came from the organizations’ PACs, their individual members or employees or owners, and those individuals’ immediate families. Organization totals include subsidiaries and affiliates. I don’t really love either list, but I would rather see a candidate get money from the private sector than government employees. Another aspect of these lists is that they probably reflect the experience of the candidates and the friends gained along the way–Mitt Romney is a businessman who moves in business circles; Barack Obama worked in government and at the University of Chicago and moved in political and academic circles. Growth in the private sector is good for the economy–growth in government takes money out of the private sector and out of the private economy. At any rate, these two lists illustrate a very basic difference between the two parties. Mitt Romney is basically a good man. Lately I think he is a little misguided. True, he does represent the establishment wing of the Republican party, but I think the establishment wing needs to step aside now that their candidates have lost in the primary elections. Unfortunately, it doesn’t look as if that is going to happen. The Hill posted an article today about some of Governor Romney’s recent activities. Mitt Romney, the GOP’s 2012 nominee, is among those courting prospects for a possible third-party bid to keep Donald Trump from the White House, according to a Washington Post report. Among those prospects are Sen. Ben Sasse (R-Neb. ), one of Trump’s most vocal Republican critics, and Ohio Gov. John Kasich, who suspended his presidential campaign in early May. Kasich’s chief strategist John Weaver said the governor isn’t interested in running an an independent. Third-party candidates historically do not do well in elections. In this case, a third-party candidate would insure that the next President would be Hillary Clinton–the candidacy would split the Republican vote. With Donald Trump as the candidate, it is possible that many Republican voters will stay home, giving the presidency to Mrs. Clinton. Some of the pundits have stated that the establishment wing of the Republican party would rather lose this election than allow a non-establishment candidate to win. That is a scary thought. It is time we got the entrenched establishment of both parties out of Washington and replaced them with people who actually represent the American people. This election may well be our last chance to do that. Think carefully before you vote. As I have previously mentioned, I am no longer a registered member of the Republican Party. That has nothing to do with Donald Trump although he was not my choice for President–it has to do with the way the Republican establishment routinely behaves. They have reached the point where they are no different than the Democratic Party. They are all about power, and power includes controlling as much of the taxpayers’ money as possible. The Republican platform is still good–it is pro-life, pro-family, and supports the things that made America great. However, the actions of the establishment Republicans in many cases do not line up with the platform. Also, recently in North Carolina, the actions of the establishment Republicans were unethical and a disgrace to the party. No wonder the voters are angry (on both sides of the political spectrum). The New Boston Post is reporting today that former Massachusetts Governor Mitt Romney will not be attending the Republican Convention this year. Governor Romney has stated that he does not support Donald Trump as the candidate and would rather write someone in. This infuriates me. If Governor Romney had taken as strong a stand against President Obama, he might have won the 2012 election. I like Governor Romney. I believe that he is a good man, but this is ridiculous. I also like George W. Bush and his father. They have stated that they will sit out the 2016 Presidential campaign. What a bunch of sore losers. As I have said before, Donald Trump was not my choice in the primary election. However, he is the only candidate left standing other than Hillary Clinton. I hope the grass roots elect him just to remind the Republican establishment that the voters are supposed to have some say in the process. If the average American voter wants to take their country back from establishment politicians, they will support Donald Trump. That was not my first choice, but right now it is the only choice we have. It’s not that I am convinced that Donald Trump will make a great President, I just think that he has had enough experience choosing good people to work with him to turn America around. I also think that he has enough wealth invested in America to want to restore our financial health. He is not my first choice, but right now he is the only choice. A vote for Hillary Clinton is a vote to put Barack Obama on the Supreme Court. Between the two of them, they will rewrite the Constitution to take away many of the basic freedoms Americans enjoy. Think carefully before you vote in November. Associated Press is reporting today that Mitt Romney will not be running for President in 2016. You can follow the link above to the article. As someone who lived in Massachusetts during the time that Mitt Romney was governor, I have a great deal of respect for him. The picture that was painted of him during the 1012 campaign as a rich, uncaring person was inaccurate. He is rich, but the stories I heard during his time as governor of Massachusetts showed him to be a caring, compassionate person. He is also a very smart man who understands how to turn failing enterprises around. As much as we will need that skill in 2016, I would much rather see Mitt Romney as a cabinet member influencing economic policy than as President. The quality that we will need in our next President is the ability to say no to the Washington establishment. We need a strong person who will face the criticism that will come with the efforts to shrink our every expanding government. Mitt Romney is smart enough for the job, but he is too nice. Did CBS Report The News Or Manipulate The News? President Obama was re-elected in 2012. He won. The Republican Candidate was portrayed as an out-of-touch rich man who caused people to die of cancer. When he warned of the dangers of Russian aggression, Mitt Romney was told, “The 80’s called, they want their foreign policy back.” It was a big joke. And when Mitt Romney pointed out that it took President Obama 14 days to admit the Benghazi attack was terrorism President Obama balked, saying he did it that day. I don’t know whether airing that exchange would have changed any votes. I don’t know how well-informed the people who voted for President Obama were. I do know, however, that it was unethical to edit that exchange out of the interview. It prevented the American voters from getting a true picture of the events at Benghazi and the President’s reaction to those events. One of the problems in America right now is politicians who value their political party more than they value their country. As a result of that values system, statements from the other party that should be heeded are mocked and ignored. We saw this principle in action with Sarah Palin in the 2008 presidential campaign and with Mitt Romney in the 2012 presidential campaign. After the Russian Army invaded the nation of Georgia, Senator Obama‘s reaction was one of indecision and moral equivalence, the kind of response that would only encourage Russia’s Putin to invade Ukraine next. Her comments may have been “strange,” but they were obviously 100 percent accurate. Because she was running on the Republican ticket, Sarah Palin’s comments were ignored and mocked. No one on the Democrat side of things was willing to listen to her. John (John Hinderaker at Power Line) noted before how the Obama campaign attacked Mitt Romney in 2012 for saying Russia was our most important adversary, but it’s also worth taking in Obama mocking Romney in their third debate, saying that “the 1980s want their foreign policy back.” That’s actually starting to sound pretty good. I don’t know what difference it would have made if Sarah Palin and Mitt Romney had been listened to, but I can’t help but think that we would have been able to react in some way had we been prepared for the Russian invasion of Ukraine. One analyst I was listening to this morning felt that if America does not do something to help the Ukrainians, Russia will turn its sights to Latvia, Estonia and Lithuania. The world is getting very complicated, and we have a President who is so convinced he knows everything that he is not paying attention to what is going on around him. Putin is playing chess and President Obama is playing checkers. President Obama needs to listen to people on both sides of the aisle–it might avoid some serious mistakes. What Is Appropriate To Discuss In A Campaign? Byron York posted an article at the Washington Examiner today discussing what is appropriate to bring up in a political campaign. There has been some recent discussion as to whether or not it would be appropriate if Hillary Clinton runs for President to bring up the Clinton scandals prior to and during President Clinton’s presidential term. …Of course Clinton’s recent experiences are relevant to a presidential run. But so are her actions in the 90s, the 80s and even the 70s. It’s not ancient history; it reveals something about who Clinton was and still is. And re-examining her past is entirely consistent with practices in recent campaigns. So by the standards set in coverage of other candidates, Clinton’s past is not too far past. Turn-about is, after all, fair play. The article points out a few other reasons why past events might be relevant to the discussion. Younger voters know Hillary Clinton as President Obama’s Secretary of State. They might be aware of some of the problems surrounding Benghazi, but generally they have no idea of the Clinton’s history. Other than the Lewinsky scandal, there is the problem of firing the White House travel office personnel in order to give the job to some friends. There is also Hillary’s rather successful attempt to divert attention away from the Lewinsky scandal by claiming a ‘vast right-sing conspiracy.’ The truth might have never come out without the blue dress and Matt Drudge. Mrs. Clinton does not have a wonderful track record when it comes to telling the truth. Even if the scandals of the Clintons are in the past, Mrs. Clinton’s pattern of behavior has continued. That is what voters need to know. On Thursday, The Atlantic posted an article written by Ted Van Dyk, a Democrat campaign strategist who once worked for Hubert Humphrey. The article examines what the current Democrat party needs to do to maintain its power in the 2016 election. He is obviously not happy with the direction his party is currently taking. Before 2008, Obama looked like a liberal of moderate temperament. He had the bad luck to take office at a time of financial and economic crises overshadowing everything else. He has said since that he underestimated at the time the depth of the crises. That no doubt led him, before growth and stability had been restored, to undertake in 2009 a remake of the entire health sector. Both his stimulus package and healthcare proposal were mainly designed by House Democratic leaders and the interest groups that supported his 2008 campaign. There was no serious attempt, in formulating either program, to draw Republicans into participation, as LBJ had done in 1965. Provisions allowing the sale of health-insurance products across state lines, and providing for meaningful tort reform, could have done that without forfeiting Democratic support. Trial lawyers would have objected but not jeopardized the bill’s passage. This is spin. The depth of the crisis had nothing to do with ObamaCare. ObamaCare was the result of lack of leadership on the part of the President–he didn’t write it, and I doubt that he has read it–he simply let the old Democrat guard in Congress put together their dream package for special interests–that is why there are so many Democrat supporters excluded from many of the regulations, e.g. union plans that are grandfathered in. Obama’s 2012 reelection is little comfort for Democrats. His total vote was smaller than in 2008, and it did not constitute a mandate for any particular agenda. It instead depended on two things: first, an unprecedentedly skillful identification and mobilization of key Obama voter groups that had grown in importance over the previous four years; and second, highly effective scare campaigns designed to convince those groups that Mitt Romney and Republicans were heartless plutocrats, servants of wealth, and enemies of women, Latinos, African Americans, and the middle class. Wedge politics and tailored political messaging can bring a campaign or even a presidency short-term success. But, for the longer run, most Americans feel they are in it together and badly want bipartisan action to keep the economy stable and growing, to keep the country safe here and abroad, and to keep American society open and fair. Americans want from Democrats what Obama promised in his 2008 campaign. Financial and economic crises diverted him, he opted for partisanship with his first-term initiatives, and the resulting gridlock leaves Democrats with three years to consider their future path. By 2016, this veteran hopes, party leaders will conclude that the big things should be tackled first and that, because of their difficulty, they must be addressed on a bipartisan basis. May they also conclude that there is more to gain by uniting all Americans than by treating them separately as political subgroups. I agree that bipartisanship is the solution, but I am not sure it is possible. Washington has become a snake pit of one-upmanship rather than a place where people actually work together to solve America’s problems. I suspect the only solution to that situation is to remove anyone from office who has been there for more than one term. It has been thirteen years since the disputed 2000 election. Younger voters who voted in the 2008 and 2012 elections probably do not have a clear picture of exactly what happened in that election. Chris Matthews isn’t helping. The Daily Caller posted a transcript of a Chris Matthews discussion with Joe Scarborough on Morning Joe on MSNBC. “Al Gore accepted the fact, even though he won by 600,000 votes, that W. was president. And the Democrats accepted the legitimacy of George W. Bush 100 percent,” he added, when host Joe Scarborough tried to push back a bit. Even under the strategy that Mr. Gore pursued at the beginning of the Florida standoff — filing suit to force hand recounts in four predominantly Democratic counties — Mr. Bush would have kept his lead, according to the ballot review conducted for a consortium of news organizations. The New York Times is certainly not a conservative newspaper. They were generally not kind to George W. Bush, but they got the facts about the recount right. Either Chris Matthews is badly misinformed or he is lying. Either way, I suspect many young voters or voters who have forgotten or were not paying attention believed him. Rewriting history is a true danger to our representative republic. It is the media’s job to tell the truth. It is a shame that they have forsaken their responsibility. Just for the record, President Obama has not been treated badly by the opposition. There have been people questioning the amount of secrecy surrounding his past–his education, some of his activities in Chicago, some of his campaign tactics, etc. Those are legitimate questions that should be asked of any candidate. Unfortunately, an element of practicing personal destruction instead of debating political issues has crept into our politics in recent times. We saw that element in the 2012 presidential election. Policies took a back seat to scare tactics and claims that Mitt Romney was a rich man who had no compassion for the poor. As someone who lived in Massachusetts during the time Mitt Romney was governor, I can tell you that there is no truth in that statement. However, the press worked hard to present that image. Until the media ignores those people practicing the politics of personal destruction, all Presidents will be treated badly by some element of the opposition. The mainstream media however, will continue to be cheerleaders for the Democrats and complain when anyone says anything negative about their candidates or the policies of their candidates. Unfortunately, that is where we are. Meanwhile, we need to guard against the rewriting of history and challenge it whenever possible. The purpose of this article is not to bring up the Candy Crowley incident again. Ms. Crowley made a mistake that had major political ramifications. That is unfortunate, but every one of us has at some time said things we regretted. If you haven’t, I congratulate you, but I have to admit that my foot occasionally finds its way into my mouth. The mainstream media has played more of a role in presidential politics than they should when they have moderated debates. When George Stepanopoulos asked Mitt Romney about birth control early in 2012, he paved the way for the charges that the Republicans were waging a ‘war on women.’ So what would happen if the debate platform were taken out of the hands of the mainstream media? DaTechGuy posted a story today about the recent statement by Reince Priebus that if NBC and CNN move forward on their documentary on Hillary Clinton, he will deny those networks access to Republican presidential debates. Those networks realize the part the debates play in skewing the picture Americans have of the candidates. Having the mainstream media moderate the debates as well as report the news probably adds at least 10 points to the approval ratings of Democrat candidates. And if past is prologue, CNN and NBC hosting GOP primary debates is a much more effective way to put Clinton in the White House than a Hillary miniseries and documentary. The left understand that CNN and NBC are at their most effective at winning elections for Democrats when they hide behind a phony shield of objectivity. For good reason, the left is concerned these Hillary projects might weaken that shield. The problem becomes if you pull out of these debates or keep these people from moderating them then the MSM storyline becomes: “GOP candidates duck real journalists.” and that would be the meme on every single network and their excuse to duck out of coverage. It will be extremely interesting to see how this all turns out. It seems rather obvious that the Internal Revenue Service (IRS) was a little unfair to to conservative groups seeking tax-exempt status, but there is more to the story. Hot Air posted an article yesterday about some other very questionable activities the IRS was engaging in during the past few years. McClatchy includes the case of Catherine Engelbrecht, which CBS News’ Sharyl Attkisson co-reported yesterday. That case, of course, goes far beyond the IRS; Engelbrecht’s business got harassed by the FBI, ATF, and OSHA as well, which would mean coordination far above the Treasury Department. They also include the case of an anti-abortion group that was told they couldn’t picket Planned Parenthood locations if they wanted to keep their exemption, and a Nebraska veteran who got hassled in an IRS audit over his donations to his church once he began donating to conservative causes. John Eastman, a constitutional law professor and former Dean at Chapman University in California, posted an article at USA Today explaining an IRS abuse that took place during the debate on homosexual marriage in California in 2012. My organization was not the only conservative-linked political group or business that appears to have faced shady actions from IRS employees. ProPublica reported this week that the IRS handed over to them confidential documents of nine conservative organizations whose applications for non-profit status were still pending. Among them: Crossroads GPS, a key group backing Mitt Romney‘s presidential campaign. Our case was particularly egregious because the IRS leak of confidential information fed directly into an ongoing political battle. For months before March 2012, the pro-gay marriage HRC had been demanding that my group, NOM, publicly identify its major donors, something that NOM and many other non-profits refuse to do. The reason is simple. In the past, gay marriage advocates have used such information to launch campaigns of intimidation against traditional marriage supporters. Just as gay marriage proponents were demanding the information, the IRS appears to have illegally given them exactly what they were looking for. The tax return released by the HRC contained the names and addresses of dozens of major donors to NOM. And there’s little doubt where the documents came from. The tax returns contained internal coding added by the IRS after the returns were originally submitted. For the IRS to leak any organization’s tax return to its political opponents is an outrageous breach of ethics and, if proven, constitutes a felony. Every organization — liberal and conservative — should shudder at the idea of the IRS playing politics with its confidential tax return information. But the situation here is even more egregious because the head of the HRC was at the time serving as a national co-chair of President Obama’s re-election campaign. On Tuesday the House Ways and Means Committee will hold hearings to allow the victims of IRS targeting to testify. During the next two weeks, the House Oversight Committee will be interviewing the ‘low level employees’ in Cincinnati who have been scapegoated for these crimes. It will be interesting to hear what they say about who was directing their activities. Keep in mind that targeting specific groups and releasing tax information is a crime. It may be an interesting week. …could someone at the IRS have leaked Romney’s tax information to Reid? At the time, Reid claimed he learned of Romney’s tax background from someone who had once been an investor in Romney’s firm, though he wouldn’t say who. The question arises because it has come to light that for the last two years, the Internal Revenue Service (IRS) has been targeting conservative groups and leaking confidential information to liberal groups. In an interview with The Huffington Post, Reid claimed he had been called by someone who had invested in Romney’s former firm, Bain Capital. That person said Romney didn’t pay taxes for 10 years. Romney’s campaign denied Reid’s accusations, eventually releasing a summary of the former Massachusetts governor’s taxes that — according to Romney staffers — showed he paid taxes over the last 20 years. But Reid continued to argue that Romney’s tax returns included something that the Republican didn’t want everyone to see. First of all, I seriously doubt the charges were true. However, since when did investors get to see the tax returns of board members of the companies in which they were investing? If in fact Harry Reid actually knew anything about Mitt Romney’s tax returns, where did he get that information? Just a note–last year was the first year my husband and I have ever been audited. I am on the membership list of a number of conservative groups that probably have applied for tax exempt status. Hopefully, that is just a coincidence. Carol Platt Liebau posted an article at Townhall.com yesterday about the Inspector General‘s report on the Internal Revenue‘s dealing with people and groups associated with conservatism. Ms. Liebau has one of those analytical minds that can sort through the fluff and get to the heart of the issue. Her article is amazing in the way it asks the questions no one investigating seemed to be interested in asking. There’s nothing in there about the targeting of individuals, as I noted last night. There’s nothing in there about who leaked documents to the media (which I wrote about here). There’s nothing in there about how an Obama relection campaign chairman came to possess confidential information he used to attack Mitt Romney. What the report reveals — more than anything else — is that it’s a starting point for some sharp inquiry by Congress, raising more questions than it answers. 2. On page 3, the report notes that “During the 2012 election cycle, some members of Congress raised concerns about selective enforcement.” What were these members told? What investigation had been done internally — and by whom — before members like Orrin Hatch were assured that their concerns were baseless? This goes to whether members of Congress were deliberately lied to — and by whom — and whether their concerns were even taken seriously in the first place. 3. Also on page 3, the report states that some members of Congress asked the IRS to investigate whether existing 501(c)(4)’s were engaged in improper campaign activity. In other words, some members were urging greater scrutiny of 501(c)(4)’s. What members were these? Whom did they contact at the IRS? What were they told, and by whom? It would be interesting to know whether any former staffers of these members participated in the wrongdoing. What’s more, if top officials were responsive to these requests, it might suggest where direction for the targeting came from. Please follow the link above to read the entire article. It is amazing how much paper you can use to say nothing and how many questions you can ask that do not lead in the direction of finding out the truth. I am reaching a point where I think 99% of the people now in power in Washington should be voted out of office. There is a lot of information coming out today about the Internal Revenue Service (IRS) targeting conservatives for excessive scrutiny. On Saturday, I posted an article which included some of the extra questions conservative groups were asked when they applied for their tax exemption status (rightwinggranny.com). The use of the IRS and other groups to target political opponents is not new–the Clintons turned it into an art form. The Obamas have also learned to use it frequently. In May of 2012, I posted an article about Intimidation of one Romney donor (rightwinggranny.com). Frank VanderSloot, the CEO of Melaleuca Inc.was subjected to the same kind of scrutiny that normally be reserved for a political candidate. Today’s Daily Caller details some of what Mr. Vandersloot was subjected to. I remember that when Barack Obama was elected, many people were complaining that we were about to enter Jimmy Carter’s second term. I don’t think that is right. I think Barack Obama has morphed into the third term of Richard Nixon. There really is a wolf, but it’s not in the sequester–it’s in the unsustainable spending which is creating an unmanageable deficit. But that ‘wolf’ is being ignored–to some extent by both sides of the aisle in Washington. Mr. Thiessen points out that so far the biggest damage done by the sequester has been to President Obama’s credibility. The credibility problem began during the final debate with Mitt Romney when President Obama stated, “The sequester is not something that I’ve proposed. It is something that Congress has proposed.” I believe the Washington Post gave the President four pinocchio’s for that statement. The problem with the internet and YouTube is that it is very easy to look up past statements of people in office. The President also stated that the sequester would never happen. Oh well. The discourse got worse. The sequester would bring plagues and pestilence; the sequester would mean that everything about America we know and love would be gone. The sky would fall, the glaciers would melt, etc. Secretary of education, Arne Duncan, claimed that teachers would get pink slips. Homeland Security began letting criminals out of jail. Children would lose the Head Start Program (which has been proven ineffective anyway). The janitors at the Capitol would take a pay cut. When investigated, all of these claims proved to be false. The posturing by the President and the Democrat Party on the sequester is not only bad politics, it is bad for the country. Can we please re-open the debate on term limits for Congress? That is probably not the total answer, but it would be a start. Yesterday the Wall Street Journal posted a story which might explain some of the difficulties Congress and the President are having in reaching a budget agreement before going over the fiscal cliff. The current American tax code is currently approximately 6,000 pages and 500 words. To say that it is difficult to navigate is a serious understatement. One of Speaker of the House John Boehner‘s suggestions has been a limit on annual deductions. During the election campaign, Mitt Romney suggested a deduction cap somewhere between $17,000 and $50,000 a year. Many liberal pundits supported the idea as representing equity. However, now that the election is over and the idea is examined more closely, there are serious consequences to this change–many of those consequences are political. …For example, 44% of Connecticut filers itemize their deductions, but only some 21% of North and South Dakota residents do. One tax writeoff in particular illustrates the point: the deduction for state and local income taxes. This allows a high-income tax filer who pays, say, $20,000 in state and local income taxes to deduct those payments from his federal taxable income. Because the highest federal tax rate is 35%, the value of the state and local deduction is enormous for high-tax states. If President Obama succeeds in raising the federal tax rate to 39.6%, the value of those deductions rises to nearly 40 cents on the dollar. This deduction certainly eases the pain of New Jersey‘s 8.97% top tax rate, or Hawaii’s 11%. The article explains that five states accounted for nearly half the tax revenue lost because of the state and local tax deduction–California, New York, New Jersey, Maryland and Massachusetts. California accounted for $51 billion of the writeoff due to state and local tax deductions. All of those five states can be found in the Democrat column during national elections. To put it another way, when Californians voted to raise their top rate to 13.3% last month, they were voting to reduce revenue for the federal Treasury and thus increase the political pressure to raise tax rates on all Americans. The state and local tax loophole helps disperse and disguise the real cost of big government. As Mr. Obama likes to say, this is reverse Robin Hood. Mr. Obama wants to raise tax rates, rather than eliminate deductions, so his fellow Democrats can keep raising state and local taxes without bearing the full economic and political cost. Tax equity and economic growth are the big losers. Because the current tax code is so politically loaded, I really don’t see Congress and the President agreeing to change it significantly. Unfortunately, it needs to be changed significantly. Yesterday Mary Katharine Ham at Hot Air posted an article detailing some of the opinions of the American voters and contrasting those opinions with the way they voted. A survey of 800 Obama voters, conducted last month by Benenson Strategy Group for the moderate Democratic think tank Third Way and shared first with POLITICO, finds that 96 percent believe the federal deficit is a problem and that 85 percent support increasing taxes on the wealthy. Yet 41 percent who supported the Democratic incumbent want to get control of the deficit mostly by cutting spending, with only some tax increases, while another 41 percent want to solve it mostly with tax increases and only some spending cuts. Just 5 percent of Obama supporters favor tax increases alone to solve the deficit, half the number who back an approach that relies entirely on spending cuts. Their opinions put them much more in line with Mitt Romney than Barack Obama! Meanwhile, according to polling by CNN, registered voters oppose Obamacare by a margin of 10 points — 52 to 42 percent. Independents like Obamacare even less, opposing it by a margin of 22 points — 57 to 35 percent. Clearly, voters didn’t think they were ratifying Obamacare when they pulled the lever for Obama. …One thing that has not changed is that Americans still widely prefer a system based on private insurance to one run by the government. Currently, 57% prefer a private system and 36% a government-run system, essentially the same as in 2010 and 2011. Prior to the passage of the Affordable Care Act in 2010, the percentage of Americans in favor of a government-run system ranged from 32% to 41%. Obviously, I have no explanation for this. Either voters were not paying attention or they voted for a candidate who opposed what they actually believed.